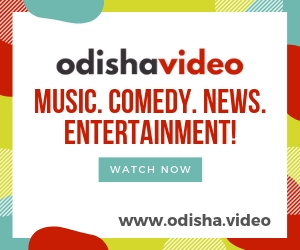 A spectacular and colorful coffee table book titled ‘Kansa Maharaja-The Hero of Bargarh Dhanu Jatra’ brought out by Odisha’s first web television channel ‘OdishaLIVE’ was released on the grand stage of Bargarh Dhanu Jatra. This innovative publication was released by Maharaja Kansa himself on the 10th day of this historic festival. On this occasion, the Minister for Odia Language, Literature, Culture & Tourism Shri Ashok Chandra Panda, Chairperson of WODC Shri Kishor Mohanty, MLA Shri Debesh Acharya, Collector and President of Festival Committee Shri Indramani Tripathy, Secretary Shri Sureswar Satapathy, Northern Range DIG Shri Satyabrata Bhoi, CEO and Chief Editor of OdishaLIVE, Shri Nilambar Rath and Director Ms Pranati Parida. Minister Shri Ashok Panda has stressed that this book will provide wider facts about Odisha’s unique culture to readers worldwide. This will also proliferate tourism potential for state of Odisha. This unique publication has framed seventy years of glorious heritage of Dhanu Jatra to disseminate information to the non Odia readers and researchers. He has thanked all who have supported this publication. Especially he has thanked Navaratna Company Nalco, OMC and Odisha Tourism for supporting this genuine effort of Odisha Live towards promoting the legacy of Odia cultural heritage and tradition of global excellence in art and culture. This coffee table book will be available at Modern Book Depot, Master Canteen, Bhubaneswar. Interested readers can also get it by contacting OdishaLIVE Office at Samanta Vihar, Nalco Square, Bhubaneswar. On the releasing event OdishaLIVE Team Members Siddharth Mishra, Harihar Badapanda, Satyabrata Padhi and Prabas Ranjan Lenka were presented.